Apple is actively blocking Chinese access to the News app shipped as part of iOS 9, a number of iPhone and iPad users recently reported, a move thought to be motivated by that country's stringent media rules. The issue was initially brought to light by software developer Larry Salibra, who last week noted Apple disables News when roaming in mainland China, a policy he finds "disconcerting." Apple has not yet acknowledge the situation, but The New York Times on Saturday cited a person with knowledge of the matter as saying News is indeed inaccessible in China. The News app can only be downloaded in the U.S., where the service is live, and test markets in Australia and the UK. Customers who purchase an iPhone or iPad and install News in a supported country can usually access content while traveling internationally, except in China where the service is completely cut off. As seen in the screenshot above, Chinese users attempting to connect to News app servers are met with an error message reading, "Can't refresh right now. 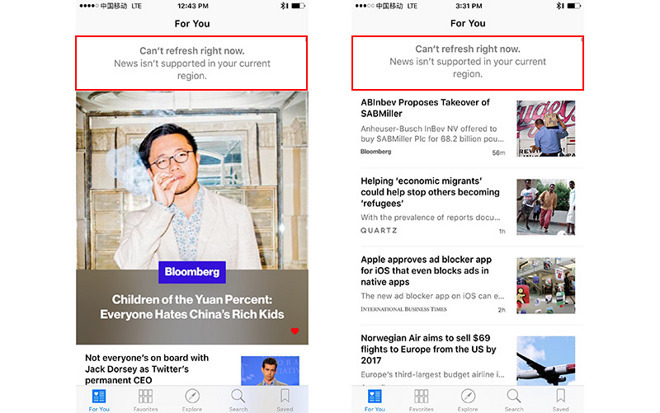 News isn't supported in your current region." In a post to his blog, Salibra details what he calls Apple's "China Kill Switch," a method of shutting off specific services based not on location. The developer conducted tests at a river crossing between Hong Kong and the Chinese mainland to find Apple blocking News access not on a device geolocation or IP basis, but by local cellular network. Without official comment Apple's motives remain unknown, though it is speculated that strict Chinese laws dictating Internet content censorship are to blame. According to The Times, Beijing generally holds individual companies responsible for filtering out "sensitive" content, meaning Apple would need to apply an automated, or curated, censorship system to its News aggregation service.